In the previous article, we have discussed the composition and structure of the earth’s atmosphere. The atmosphere is essential for the survival of plant and animal life. They also require the optimum temperature to keep themselves warm and grow. In this article, we are going to discuss in details about some of the topics like insolation, terrestrial radiation, heat budget of the earth, albedo, etc. As we all know, the sun is the primary source of energy for the earth. The sun radiates its energy in all directions into space in short wavelengths, which is known as solar radiation. The earth’s surface receives only a part of this radiated energy (2 units out of 1,00,00,00,000 units of energy radiated by the sun). The energy received by the earth’s surface in the form of short waves is termed as Incoming Solar Radiation or Insolation. The amount of insolation received on the earth’s surface is far less than that is radiated from the sun because of the small size of the earth and its distance from the sun. Moreover, water vapour, dust particles, ozone and other gases present in the atmosphere absorb a small amount of solar radiation. 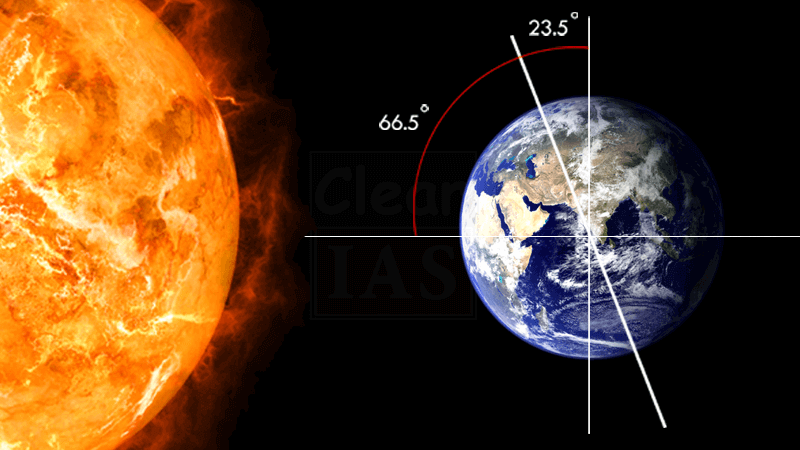 The solar radiation received at the top of the atmosphere varies slightly in a year due to the variations in the distance between the earth and the sun. During the earth’s revolution around the sun, the earth is farthest from the sun on 4th July. This position of the earth is called aphelion. On 3rd January, the earth is nearest to the sun. This position is called perihelion. Due to this variation in the distance between the earth and the sun, the annual insolation received by the earth on 3rd January is slightly more than the amount received on 4th July. However, the effect of this variation is masked by some other factors like the distribution of land and sea and the atmospheric circulation. Hence the variation does not have a greater effect on daily weather changes on the surface of the earth. The rotation of the earth on this inclined axis has a greater influence on the amount of insolation received at different latitudes. Since the earth is a geoid resembling a sphere, the sun’s rays strike the surface at different angles at different places. This depends on the latitude of the place. 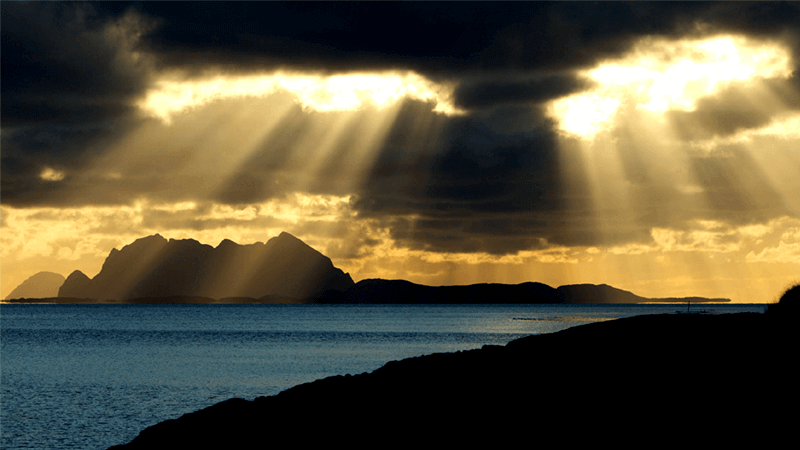 The area covered by the vertical rays is always less than the slant rays. If more area is covered, the energy gets distributed and the net energy received per unit area decreases. Moreover, the sun’s rays with small angle traverse more of the atmosphere than rays striking at a large angle. Longer the path of the sun’s rays, greater is the amount of reflection and absorption of heat by the atmosphere. As a result, the intensity of insolation is less. Duration of the day varies from place to place and season to season. It decides the amount of insolation received on the earth’s surface. The longer the duration of the day, the greater is the amount of insolation received. Conversely shorter the duration of the day leads to receipt of less insolation. The transparency of the atmosphere depends upon the cloud cover and its thickness, dust particles, water vapour, etc. They reflect, absorb or transmit insolation. Thick cloud hinders the solar radiation to reach the earth’s surface. 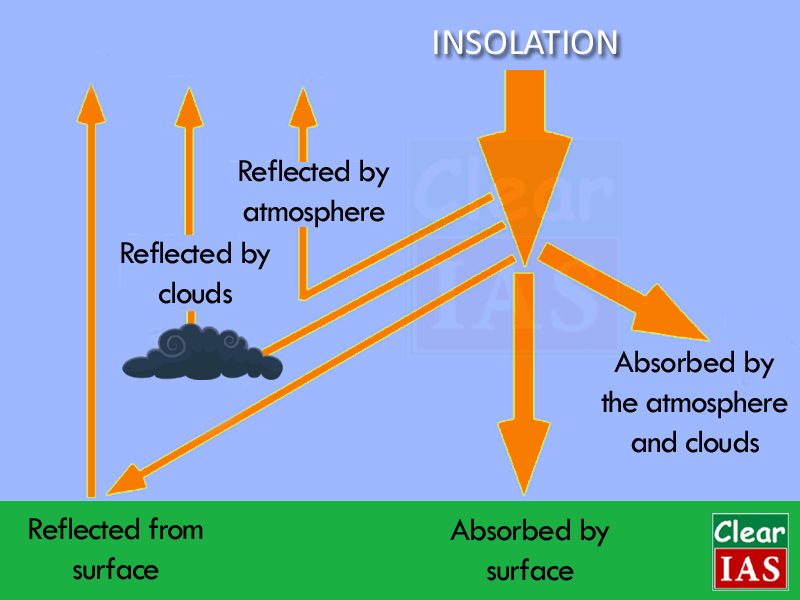 Similarly, water vapour absorbs solar radiation resulting in less amount of insolation reaching the surface. When the solar radiation passes through the atmosphere, water vapour, ozone and other gases absorb much of the near infrared radiation (mainly in the troposphere). Very small suspended particles in the troposphere scatter visible spectrum both to space and towards the earth’s surface. This process adds colour to the sky. The red colour of the rising and the setting sun and the blue colour of the sky are the results of scattering of the light within the atmosphere. Note: Maximum insolation is received over the subtropical desert, where the cloudiness is the least. The equator receives comparatively less insolation than the tropics. Generally, at the same latitude, the insolation is more over the continent than over the oceans. 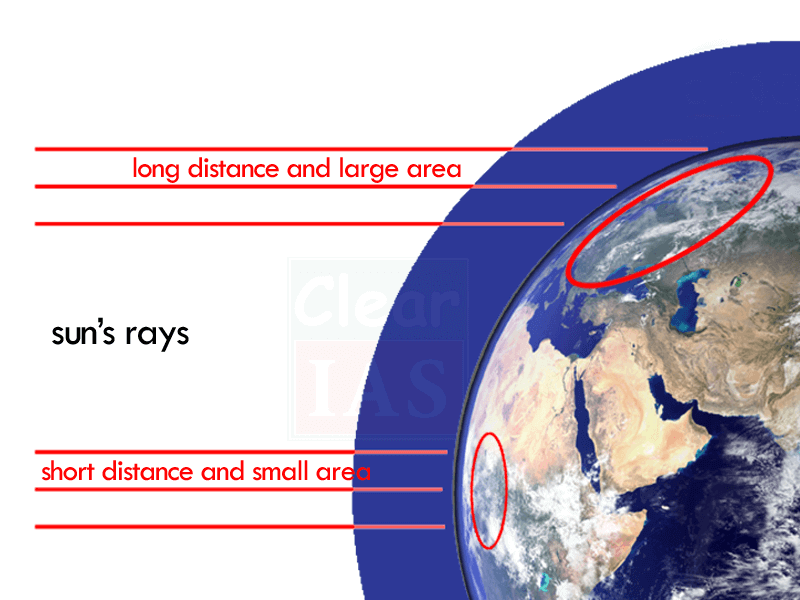 In winter, the middle and higher latitudes receive less radiation than in summer. Before discussing terrestrial radiation, the following facts about radiation are worth noting. i) All objects whether hot or cold emit radiant energy continuously. ii) Hotter objects emit more energy per unit area than colder objects. iii) The temperature of an object determines the wavelength of radiation. Temperature and wavelength are inversely proportional. Hotter the object, shorter is the length of the wave. So, when the earth’s surface after being heated up by the insolation (in the form of short waves), it becomes a radiating body. The earth’s surface starts to radiate energy to the atmosphere in the form of long waves. This is what we call as terrestrial radiation. This energy heats up the atmosphere from bottom to top. It should be noted that the atmosphere is transparent to short waves and opaque to long waves. The long-wave radiation is absorbed by the atmospheric gases particularly by carbon dioxide and other greenhouse gases. Thus, the atmosphere is indirectly heated by the terrestrial radiation. The atmosphere, in turn, radiates and transmits heat to space. Finally, the amount of heat received from the sun is returned to space, thereby maintaining a constant temperature at the earth’s surface and in the atmosphere. Transfer of heat by the movement of a mass or substance from one place to another, generally vertical, is called convection. The air of the lower layers of the atmosphere gets heated either by the earth’s radiation or by conduction. The heating of the air leads to its expansion. Its density decreases and it moves upwards. The continuous ascent of heated air creates a vacuum in the lower layers of the atmosphere. As a consequence, cooler air comes down to fill the vacuum, leading to convection. The cyclic movement associated with the convectional process in the atmosphere transfer heat from the lower layer to the upper layer and heats up the atmosphere. 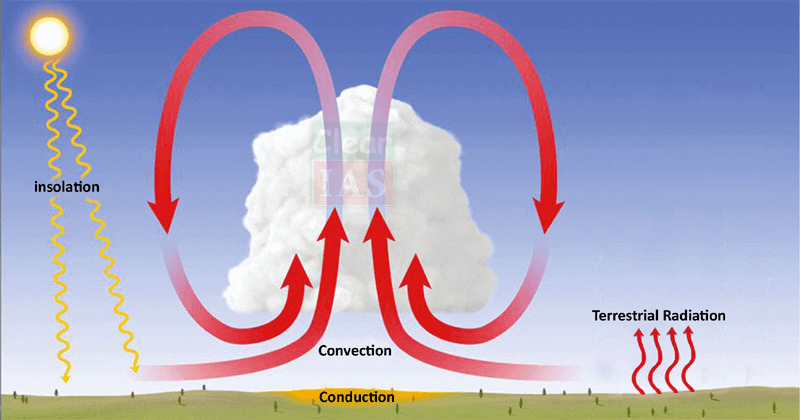 The convection transfer of energy is confined only to the troposphere. The transfer of heat through horizontal movement of air (wind) is called advection. Winds carry the temperature of one place to another. The temperature of a place will rise if it lies in the path of winds coming from warmer regions. The temperature will fall if the place lies in the path of the winds blowing from cold regions. Horizontal movement of the air is relatively more important than the vertical movement. In the middle latitudes, most of diurnal (day and night) variations in daily weather are caused by advection alone. In tropical regions particularly in northern India during the summer season, local winds called ‘Loo’ is the outcome of advection process. 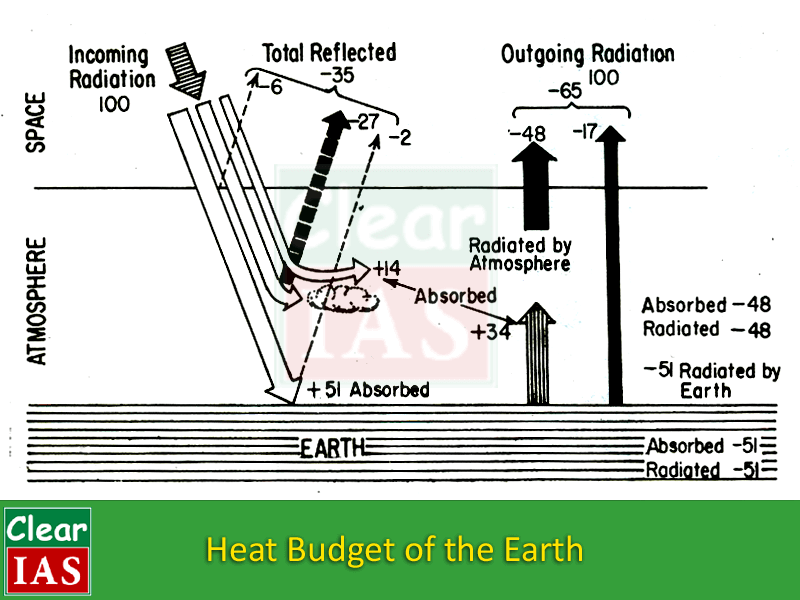 This balance between the insolation and the terrestrial radiation is termed as the heat budget or heat balance of the earth. Albedo can be simply defined as a measure of how much light that hits a surface is reflected back without being absorbed. It is a reflection coefficient and has a value less than one. 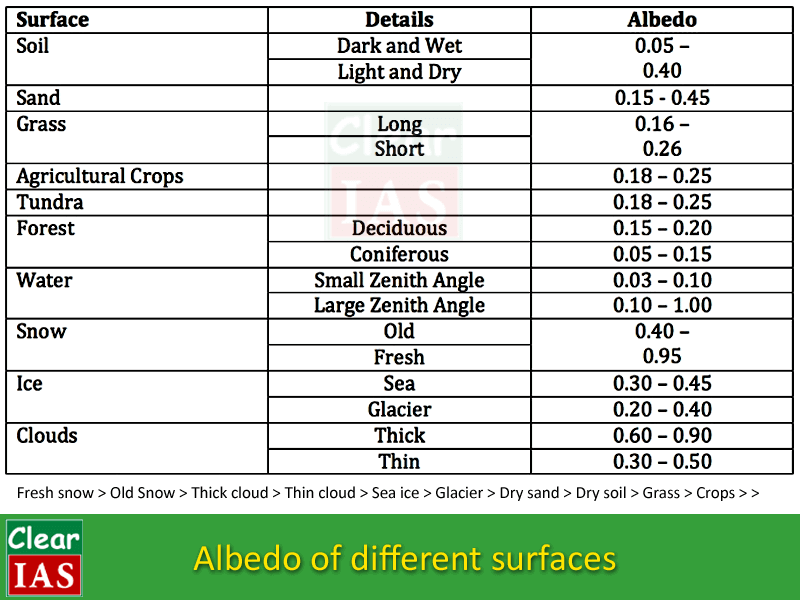 The value of albedo will be different for different surfaces. Because of the effect of albedo, highly developed areas such as urban cities can experience higher average temperatures than the surrounding suburban or rural areas, a phenomenon known as the “Urban Heat Island Effect”. The higher average temperature can be attributed to less vegetation, higher population densities, and more infrastructures with dark surfaces (asphalt roads, brick buildings, etc.). Although the earth as a whole maintains a balance between the insolation and the terrestrial radiation, this is not true what we observe at different latitudes. As we have discussed earlier, there are variations in the amount of insolation received at different latitudes. In the tropical region, the amount of insolation is higher than the amount of terrestrial radiation. Hence it is a region of surplus heat. In the polar region, the heat gain is less than the heat loss. Hence it is a region of deficit heat. Thus the insolation creates an imbalance of heat at different latitudes. This imbalance is nullified to some extent by winds and ocean currents, which transfer heat from surplus heat regions to deficit heat regions. Note: Topics like Temperature, Factors controlling Temperature and Distribution of Temperature will be covered in the next article. Thank You so much. Very Interesting and knowledgeable. God bless You. Very good…. Great elaborate more deeply please.. This is my first topic i started preparing for IAS..It is very useful and interesting too..thanks a lot..
when will you publish your next article on the topic mentioned above……??? As your lectures are really helpful to understand the basic concepts. I am eagerly waiting for the same . Mujhe samaj ni aya…yeh earth ka inclination or revolving angle kya h..n insolation mai revolution be toh hona chaiye. NOTE IS VERY GOOD QUALITY, THANKS, SIR. 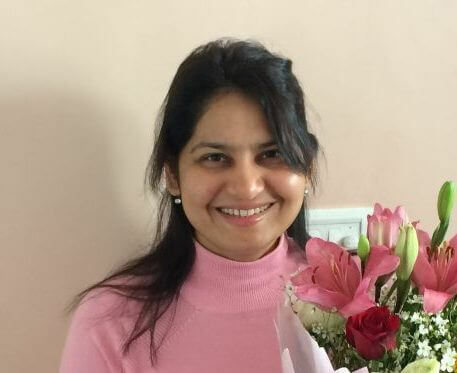 How heat budget is disturbed? Thanks sir . 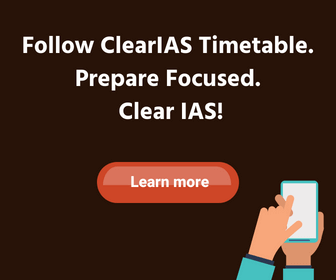 Now I started my I A S preparation with CLEAR I A S . It’s very useful and helpful to understanding heat budget . Thank you so much, very informative article. How come Earth goes farther in July Aphelion & closer to sun in January-> That would lead winter in july & summer in january.. Thanks a lot.. Nice content.